The Sultan's Palace, or Kraton, with its grand and elegant Javanese architecture, lay in the centre of the municipality. It was built in 1775 by Pangeran Mangkubumi, whose the son, the prince, was then called Sri Sultan Hamengku Buwono I. This palace site is lay exactly between Winongo River and Code Rivera swamp area that had dried up. The Sultan's palace stretches from north to south. The front yard of the palace is called Alun-alun Utara (North Square) and the back yard called Alun-alun Selatan (South Square). The design of this historical building demonstrates that the palace, the obelisk (the Tugu, the column) and Mount Merapi positioned in one line. It is believed that the axis is blessed. In the old-times, The Sultan used to concentrate his mind along this axis before leading a meeting, making decision and giving order to his people. Each part of the building has its own name. The palace meeting hall is called Pagelaran. It is the place where formal meetings of the Kraton's officials are held. Manguntur Tangkil Hall is the place where the Sultan has his seat. This hall is in the Siti Hinggil. Siti means ground/land, while Hinggil means high. So, it is called Siti Hinggil because the place where it was built is higher than any other ground around it. It was once a tiny island on the swamp. The front gate is called Danapratopo. Two giant statues called Gupala guard it. One is called Cingkorobolo and the other is Boloupoto. The two statues are perceived may protect the palace from any harm or evil. The main part of the Kraton is called Purworetno, a place where the Sultan performs his duties. Beside Purworetno, there are two-story buildings called Panti Sumbaga. This building is the Sultan's private library. The building where the Sultan lives is called Gedong Kuning. 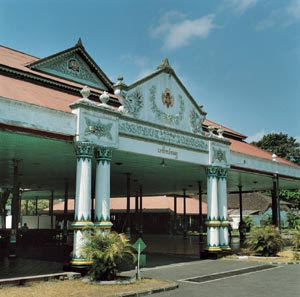 Visitors of the palace can enjoy the atmosphere of the Kraton as it was centuries ago. Wedding ceremonies and palace meetingsoften held with puppet showshelp to re-create the ancient setting. Many sets of Gamelan instruments, antiques, and heirlooms make the Sultan's Palace as one of the most interesting tourist site in Yogyakarta. The palace is now the dwelling place of sultan Hamengku Buwono X and his family.